Decision: Should you play Light Armour? Skaven and Sepulchral Guard probably should play Light Armour unless they are going 100% into hold-objective style defensiveness. Players who are already playing Haymaker and/or Aggressive Defense might also consider it. Everyone else should probably pass. Upgrades that impose a penalty on the upgraded model are rare in Shadespire. All upgrades have a glory cost, of course, and all upgrades represent an opportunity cost in terms of the "slots" they occupy in the power deck - but only rarely do upgrades like Light Armour impose additional costs on the player. In order for us to consider an upgrade like that to be playable, it must provide a higher than average bonus to counteract its additional costs. 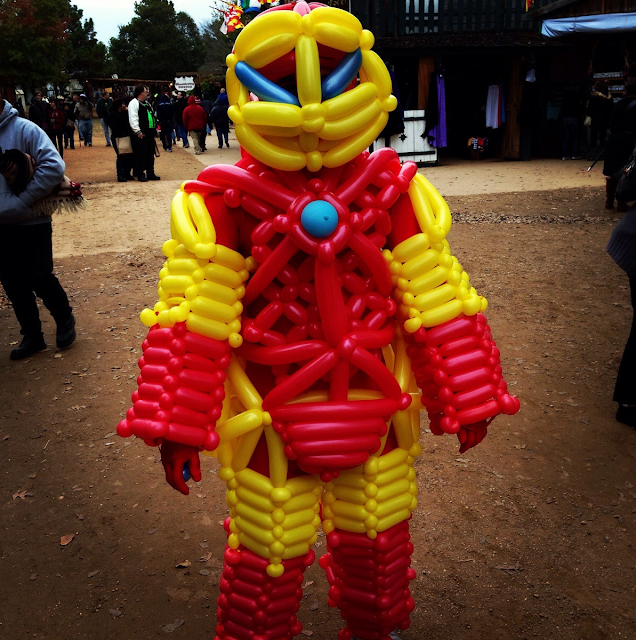 Does Light Armour fit the bill? Let's find out. The first thing we should examine is just how much does losing critical symbols as a success on defense hurt? At it's simplest level, the change can be estimated by comparing success rates across different defense types. A model with a 1-shield defense (50%) will roll raw successes at about the same rate as a model with 1-dodge defense (33.3%) once the former is equipped with Light Armour. Similarly, a model with 1-dodge base (33.3%) will downgrade to a success rate equal to a 1-shield-but-got-cleaved rate (16.67%) once they are suited up with this upgrade. This penalty can be more or less severe on various models, based on the number of defense dice they roll. A 1-die model of either type will lose 16.67% raw success chance on defense when they upgrade with Light Armour. A 2-shield model, on the other hand, loses almost 20%; while a 2-dodge model loses 25%! As the number of defense dice our model rolls increases, the loss becomes more severe for dodge-based models (around 28% for a 3-die model and 29% for a 4-die model). Models with shield-based defenses, conversely, see their greatest loss at 2 dice, and diminishing marginal losses as the number of dice increases (17% at 3-dice and 13.5% at 4). Unfortunately, that isn't the end of the penalty here. You also completely lose the trump-card quality of critical successes. As the average attack rolls more dice than the average defense, this is especially problematic. Quite often, you will find yourself in a situation where your only out is a critical success on defense - and Light Armour makes this impossible. Statistically, this is a little harder to track the impact of, since it largely depends on your opponents' rolls; however, we can make some generalizations. Critical successes are most important - dare we say critical - when the disparity in the number of dice is high. If your army rolls a relatively low number of defense dice and your opponent rolls a high number of attack dice, the loss of critical successes will hurt you more. So far, Light Armour sounds really terrible; but, it can't be stressed enough, it provides a bonus that is essentially unique in terms of universal upgrades. Currently, only two other universal upgrades - Army of One and Rising to the Challenge - provide a blanket +1 bonus to attack, and they are both heavily conditional. Tome of Warfare can provide a +1 attack bonus, but at the cost of an extra activation for each attack that gains the benefit. Beyond the universal upgrades, only two warband-specific upgrades provide a +1 attack bonus, and each of those is restricted to a single model. The extremely limited number of upgrades that give this bonus should tell us is that it's quite a good bonus. Yes, there are a couple of upgrades that grant a +2 bonus to attack in limited situations, but at this time they are all limited in the number of times they can be used. Light Armour and its comparable substitutes are not limited in this way. Since all of the upgrade options that provide bonuses to attack are either limited use, restricted in who can equip them, conditional, or come with a significant penalty, it is probably safe to assume that a blanket +1 bonus to attack that is available to any model is too good to put on an upgrade without a downside. But just how good is it, mathematically? Again, we see some variance between the two types of attacks. Unlike with the defense penalty, however, these bonuses scale similarly (due to the fact that they are simply increases in the number of dice rolled, not increases in success conditions). For all models, the die increase will show the most statistical benefit in terms of raw success chance to 1-die attacks, and will provide diminishing returns as the number of base dice for the attack increases. The greatest increase in raw accuracy can be seen in an 1-axe base attack (25%), with 1-sword attacks gaining slightly less (22%). However, as the number of dice in the base attack increases, the decrease in marginal gain for raw accuracy is less severe on sword-based attacks than axe-based ones. So which model benefits the most from Light Armour? Well, the ideal target would be a model with a shield based defense that rolls as many dice as possible for that defense and also has a 1-axe based attack that has a high damage output. However, as of yet, there aren't any shield-based models who roll 3 defense dice at base, and the only base 3-dodge model can't benefit from Light Armour. So instead, we're likely looking for a 1-die defense model. We want to value models with 1-axe attacks highly, but 1-sword attacks are almost as good in terms of how much you gain from Light Armour. Finally, we want to try to choose high damage attacks, but we'll take what we can get. Obviously, any model could theoretically benefit from Light Armour, but we're looking to get the most bang for our buck by reducing the impact of its penalty while maximizing the effect of its bonus. So, who best fits this bill? We can immediately discount the Sigmarite models for the most part - they generally have high attack stats and most of them defend with 2-shield dice after inspiration. Inspired Nighthaunts and Gitz are largely out as well since they almost all defend with 2-dodge dice (uninspired Sourtongue actually represents a nearly perfect target, but if you're keeping that guy uninspired what's the point?). Orcs, Dwarves, and Eyes of the Nine all represent middling choices for Light Armour targets, with some models benefiting significantly more than others within their warbands. Garrek's Reavers certainly fit the defensive statline we are looking for, but their attacks tend to have a higher base accuracy than we would ideally like. Zharkus and Ghartok from Magore's Fiends initially look like good targets, but Light Armour will significantly reduce the number of times they get to use their counterattacks - which also happens to be the attack that gains the most benefit from their equipping it. That leaves us with two really excellent options for putting Light Armour on. The Skaven warband's three unnamed rats all start with 1-die defenses and poor accuracy attacks. Any one of them makes for a great target for Light Armour - though the defensive penalty increases when they inspire. The Sepulchral Guard is perhaps an even better fit for Light Armour, as their models retain a 1-die defense even after inspiring. The Harvester is perhaps the single best target in the game for Light Armour, as his multi-target attack benefits even more from additional dice than other attacks. Perhaps most importantly of all, all 3 unnamed rats and all the non-leader models in the Guard can rise from the dead if Light Armour's defense penalty proves to be their end. As such, these two warbands should most certainly be considering Light Armour for inclusion. 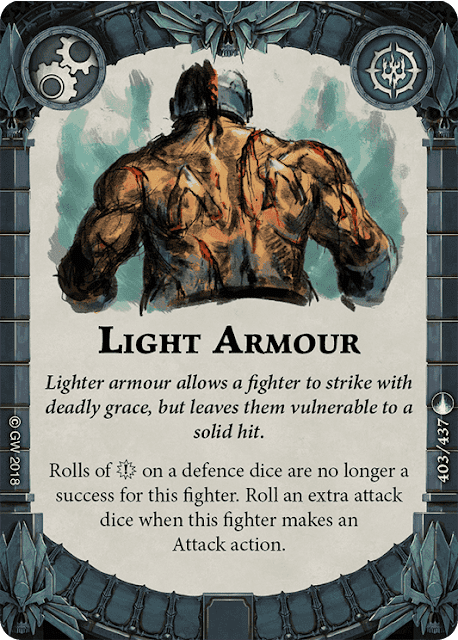 In addition to the statistical improvement to attack provided by Light Armour, there are a few other cards that work well in combination with it. Aggressive Defense, for example, denies you the ability to make a defense roll at all, so the penalty from Light Armour is essentially negated for an attack. That said, if you're playing a low-wounds model, this combo can quickly go bad on you. A similar combination effect can be reaped by playing Haymaker with Light Armour. Generally, we try to play Haymaker on the last activation of a round, but if you need to hit with something earlier than that, combining it with Light Armour provides a one time +3 attack and effectively negates the penalty from Light Armour for the rest of the round (replacing it with the worse penalty from Haymaker, to be fair). These aren't so much reasons to play Aggressive Defense and Haymaker as they are to consider inclusion of Light Armour if you are already playing one of the other two. Finally, Light Armour pairs nicely with Concealed Weapon, as the extra die provides a significant increase in the chance that Concealed will trigger. If we were to play less than ideally, purely for the purposes of statistical maximization, we might equip both upgrades to an uninspired Sourtongue, increasing the average damage ouptut on his base attack from 1 per unblocked use to 2.28. But let's not do that, ok? As mentioned above, it's impossible to find a universal upgrade that provides +1 attack at this point without a condition or drawback. Of the available options, Rising to the Challenge is probably the least restrictive; Army of One is simply too unreliable to even consider. 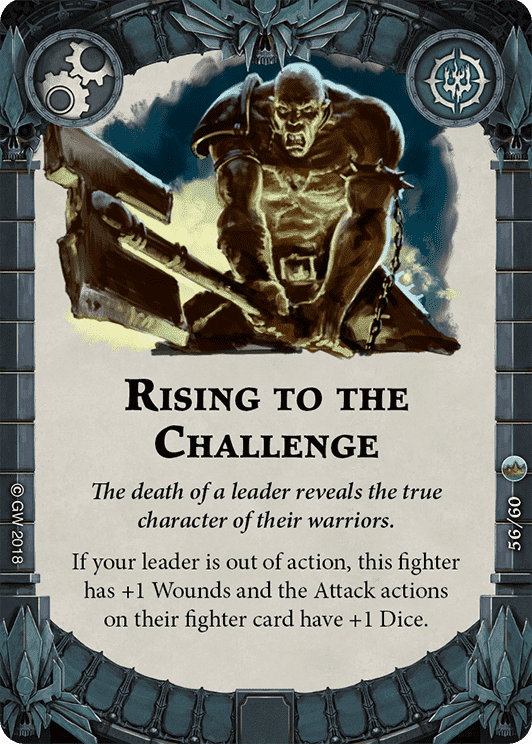 Rising to the Challenge, on the other hand, can be pretty easily achieved by warbands that play aggressively with their leaders. Orcs, Fiends, and Dwarves are all particularly well suited to playing this upgrade because A) they have strong leaders that encourage aggressive play and B) they each have a strong secondary model that becomes essentially leader-quality when upgraded with Rising to the Challenge (Bonekutta, Riptooth, and Tefk, respectively). Not only does Rising to the Challenge provide the same +1 attack bonus as Light Armour, but it actually makes the upgraded model harder to kill (by providing +1 wound) as opposed to easier. Given the choice, we should always choose the effects from Rising to the Challenge over those from Light Armour. The problem with that thinking is that we don't always get the choice - Rising to the Challenge does nothing when your Leader is still on the board. Essentially, if you are looking for a +1 bonus to attacks, choose Rising to the Challenge if you intend to hurl your leader haphazardly into the fray, and Light Armour if you aren't. Light Armour is by no means an auto-include in all decks. The bonus it provides is unique, but its drawback is significant. However, it provides exceptional utility to Skaven and Sepulchral Guard players who are looking to kit out a resurrectable model with highly aggressive upgrades and aren't worried about spending interactions or ploys to bring that model back if it does die.